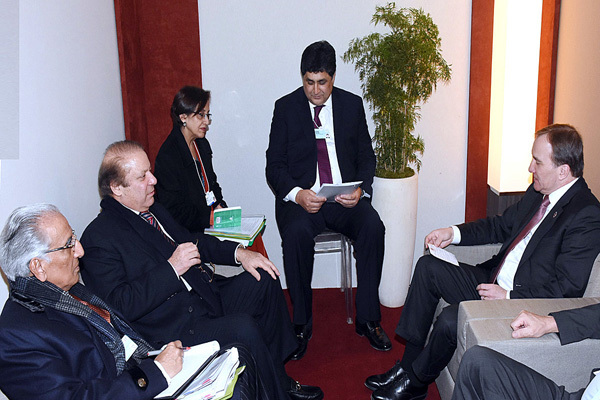 DAVOS (Switzerland), Jan 18 (APP): Prime Minister Muhammad Nawaz Sharif Wednesday shared with his Swedish counterpart the gruesome human rights violations in the Indian occupied Jammu and Kashmir and urged a greater role of international community in that regard. He was talking to Prime Minister of Sweden Stefan Löfven here at the Congress Centre of the World Economic Forum. The Prime Minister is in Davos for the 47th Annual Meeting. Prime Minister Nawaz Sharif said Pakistan extended full political, moral and diplomatic support to the people of Kashmir, who were striving for their right to self determination. He also pointed to the UN resolutions in that regard that called for a plebiscite. The Swedish Prime Minister shared Pakistan’s concerns over the situation in Occupied Jammu and Kashmir. He said Sweden was keen to further strengthen and broaden ties with Pakistan, in all spheres. He said his government was already working closely with Pakistan in many areas and would like to work closely with its people and the Government. He hoped greater interaction between Pakistan and Sweden would be mutually beneficial. The two leaders also discussed bilateral relations and ways to further boost them.